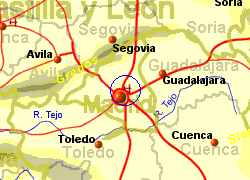 Madrid (Brajas) Airport is located 13Km North East of the city centre with good access to the motorway system. 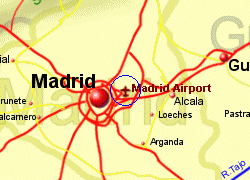 This Spain's largest and busiest airport, handling around 50 million passengers per year. Bus to city centre approximately €3. Taxis according to distance travelled. A free shuttle bus runs between the terminals every 5 minutes at peak times, less frequent at other times, with a journeyn time of upto 20 minutes.